(AllHipHop News) Eminem’s new verse on “No Favors” has been drawing headlines around the world, since Big Sean’s album I Decided was released yesterday. Conservative, commentator, author and television talking head Ann Coulter was also on the receiving end of the angry verse from Eminem. And f##k Ann Coulter with a Klan poster/With a lamp post, door handle, shutter/A damn bolt cutter, a sandal, a can opener, a candle, rubber/Piano, a flannel sucker/some hand soap, butter/A banjo and manhole cover/Hand over the mouth and nose/ smother/Trample ran over the tramp with the Land Rover/The band, the Lambo, Hummer and Road Runner/Go ham donut, or go Rambo/gotta make an example of her/That’s for Sandra Bland, ho, and Philando/"
Ann Coulter had some things to say about Em’s verse and accused “the left” of being hypocrites. 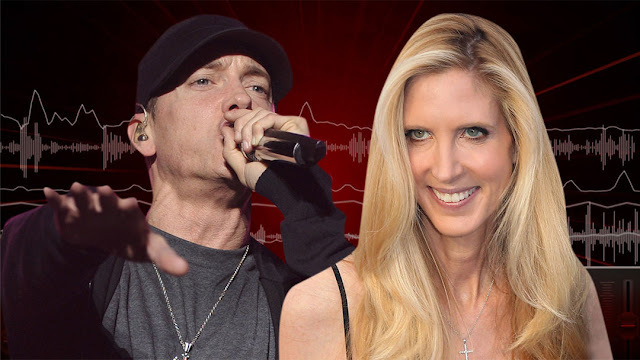 “Well I think it’s unfortunate the the left from Berkeley to Eminem, with his rap songs, has normalized violence against women, as Eminem has done,” Ann Coulter said. “He talks about f##king women with an umbrella until the ‘bleep’ comes out,” she continued. “This goes on for years. He denounces gays using ugly terms. His homophobia and his misogyny is quite well known. Eminem’s verse on Big Sean’s song “No Favors” is his latest attack on Trump.